High Performance Dry Fog Adelaide Port. For Shipping. Manufacturing. Mine Processing. Rainstorm High Performance Dry Fog Systems are built inhouse with custom design add ons with specialist lines, nozzles and components fit for purpose and site conditions. Rainstorm provide dust control for shipping, manufacturing and mine processing facilities. 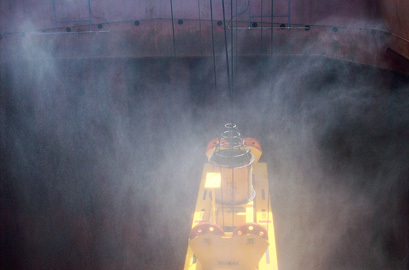 For controlling ship loading dust issues Rainstorm dry fog systems reduce dust to improve safety, and reduce ore loss in transfer, improving delivery. Rainstorm led dry fog system uptake in Australia with the design and implementation of ship Dry Fog Systems to solve dust issues, such as the Adelaide Port Project for an iron ore exporter. The South Australian Environmental Protection Authority (SA EPA) backed the system idea and once the Fog System was installed and commissioned, the SA EPA enabled the loading of iron ore in close proximity to areas sensitive to dust due to the high performance dust control from Rainstorm Dry Fog Systems. NT | QLD | WA | SA | Port & Site. 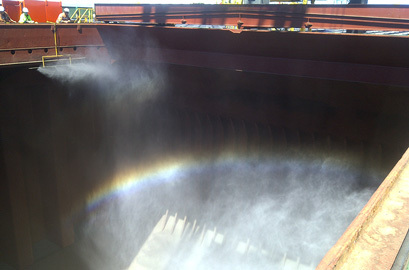 Rainstorm have designed and installed Dry Fog Systems for copper concentrates in Darwin Port Northern Territory, minerals exported via Geraldton WA, Coal Facilities in Queensland and major mining projects in South and Western Australia, including the design and installation of multiple Dry Fog Systems for Rio Tinto Pilbara Iron Operations for crushing and screen house circuits. Photos show Rainstorm Dry Fog Systems for the Iron Ore Transhipper, CSL Whyalla, South Australia & Mine Process Facilities in the Pilbara.